First hollow stem is the optimal time to remove cattle from wheat pasture (full explanation). We measure first hollow in our September-sown wheat forage plots at Stillwater each year, and normally have approximately 50% of varieties at or past first hollow stem by March 1st. I have posted first hollow stem measurements from these plots in a table at the end of this blog. WB-Grainfield and AG Robust have reached first hollow stem since our last update. First hollow stem is the optimal time to remove cattle from wheat pasture (full explanation). We measure first hollow in our September-sown wheat forage plots at Stillwater each year, and normally have approximately 50% of varieties at or past first hollow stem by March 1st. I have posted first hollow stem measurements from these plots in a table at the end of this blog. As of Monday the varieties, Billings, Gallagher, Iba, Bentley, NF101, WB-Cedar, WB4458, Winterhawk, WB4515, WB4721, WB4303, SY Flint, Sy Llano, SY Drifter, SY Razor, SY Grit, Everest, and Zenda were all at or past first hollow stem at Stillwater. Please note that WB4515 was incorrectly labeled as WB4455 in the past couple of posts. Also note that experimental line OK0728W has been released as Stardust hard white winter wheat. We will take another set of measurements at the end of this week and report the results on this blog. Keep in mind that the numbers reported from Stillwater are likely behind those being observed in southern Oklahoma and ahead of those observed in northern Oklahoma. 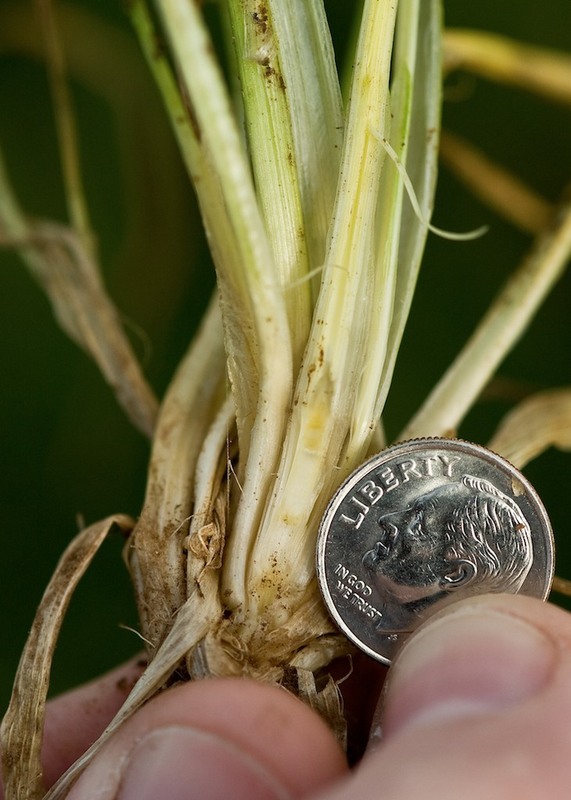 The First Hollow Stem Advisor on the Oklahoma Mesonet can provide an indication of where varieties are regarding first hollow stem in your area. First hollow stem measured in wheat sown 09/15/2015 at Stillwater, OK.
First hollow stem is the optimal time to remove cattle from wheat pasture (full explanation). We measure first hollow in our September-sown wheat forage plots at Stillwater each year, and normally have approximately 50% of varieties at or past first hollow stem by March 1st. I have posted first hollow stem measurements from these plots in a table at the end of this blog. No varieties are currently at first hollow stem at Stillwater, but given the warm conditions and the estimates from the first hollow stem advisor on the Mesonet, I anticipate we will have some varieties past first hollow stem by next week. Note that while no varieties are currently at first hollow stem, the overall average first hollow stem measurement increased as compared to 02/16/15. Dillon Butchee reported early sown Gallagher in the Altus area was at first hollow stem. Keep in mind that the numbers reported from Stillwater are likely behind those being observed in southern Oklahoma and ahead of those observed in northern Oklahoma. The First Hollow Stem Advisor on the Oklahoma Mesonet indicates that early varieties in southern Oklahoma are likely past first hollow stem and that early varieties in central Oklahoma will reach this point within a week. Jim Johnson with the Noble Foundation reported that the estimates on the first hollow stem advisor were matching closely with his observations in the field around the Ardmore area. My advice is to start looking for a home for cattle on wheat pasture. First hollow stem is the optimal time to remove cattle from wheat pasture (full explanation). We measure first hollow in our September-sown wheat forage plots at Stillwater each year, and normally have approximately 50% of varieties at or past first hollow stem by March 1st. I have posted first hollow stem measurements from these plots in a table at the end of this blog. No varieties are currently at first hollow stem at Stillwater, but given the warm conditions and the estimates from the first hollow stem advisor on the Mesonet, I anticipate we will have some varieties past first hollow stem by the end of the week. We will take another set of measurements at the end of this week and report the results on this blog. Since my last report, I don’t believe a lot has changed with the disease situation. Similar to what I indicated in mid-December, I have continued to find small pustules of powdery mildew and a few scattered leaf rust pustules in rank wheat around Stillwater. The temperature and weather has been such that these two foliar diseases (powdery mildew and leaf rust) have been able to persist but have not increased in the wheat around Stillwater. This seems to be the case for southwestern and south central OK as well. Wheat soilborne mosaic virus can cause yellowing in the spring in susceptible varieties such as the one on the left. Mature Hessian fly larvae are brown in color and often referred to as flaxseed. Tillers with larvae will not recover and will eventually die and slough off. Spring-planted oat has been a “go to” forage crop for southern Great Plains beef producers for years. It is a good option when winter wheat was not planted in the fall due to wet conditions, or, as is the case this year, when wheat failed to emerge due to drought. Forage production potential for spring-planted oat is around 1,500 to 2,00 lb/ac, but you will need about 60 – 75 lb/ac of nitrogen to make this type of yield. Dr. Daren Redfern and I wrote a fact sheet detailing spring oat production for hay and it can be found by clicking here or going to www.wheat.okstate.edu under “wheat management” then “seeding”. I will provide the Cliff’s Notes version below.